It’s a digital world. Have you ever tried Googling yourself? With every site you visit on the internet, every post you make on your social media accounts, you leave a trail of data. Whether your information is shared intentionally or not, it’s being gathered by current employers, prospective employers and even companies from which you shop. This is called your digital footprint. Your digital footprint is often used to obtain personal information about you, such as demographics, race, religion, political affiliation, or interests. Information may be gathered using cookies, which are small files websites store on your computer when you visit, to track user activity. Cookies allow you to hold items in a shopping cart, store preferences or login information, and for making personalized suggestions based on your location or interests. Anything you voluntarily post online also contributes to your digital footprint. This includes YouTube videos, blog posts and statuses, or photos shared on social media sites. It’s important to keep in mind that once it’s online, it may be there forever. Every day most of us contribute to an evolving public presentation of who we are that everyone can see and that we cannot erase. We might think we’re at home on our laptops, cell phones, tablets, communicating with just a few friends on our Friend list. But in reality we are in a huge auditorium speaking into a public address system to a world that can record and redistribute everything that we say. These days, it’s standard for hiring managers and recruiters to check out your LinkedIn, Facebook, Twitter, and other social media profiles. What are they going to find? As technology gets more sophisticated, tech savvy hiring managers and recruiters can piece together your profile to tell a story using tools that are readily available. When you look at two or three status updates on your social media profile, they may tell one story, however, when you look at them in a timeline, they may paint a completely different picture. Are you an over-sharer, whiner, arguer, boundary-crosser, or one-upping person when posting online? What is your personality? Are you open, creative, inventive, logical or easy going? It’s important to know what image you’re projecting and if it is an accurate one. 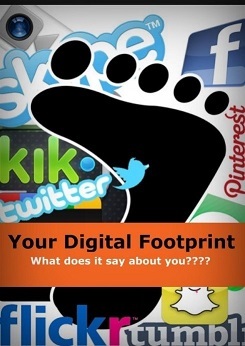 Here are a few tools to help you understand your digital footprint. When you enter your link to your Facebook profile, the company analyzes the language of your posts to predict personality, and it is surprisingly accurate. Magic Sauce ranks you on the five personality traits: openness, conscientiousness, agreeableness, extraversion, and neuroticism. Their models are based on over 6 million individual social media profiles and actual scores on psychometric assessments. This site searches the internet to find all of your public profiles, and it presents the information that it uncovers. Some of the information may be sensitive in nature, and not the type of information you may want a prospective employer to see. There is a paid version of the service which gives you more options such as viewing online records, who has been searching for you on Google, and much more. This site may be able to remove sensitive information with the paid version of the service. This is a people search engine that organizes White Pages listings, Public Records and Social Network information. A search returns phone numbers, addresses, emails, and photos. Its services are confined to the United States. Most job seekers know that they should search for their name with a search engine such as Google. But you should also search for your phone number and email address to see what comes up. You might be surprised by what you find. Start thinking about how you project yourself to the world and the reputation you leave with your digital footprint. Work on building an online profile which showcases your professional strengths and capabilities. Good Luck!